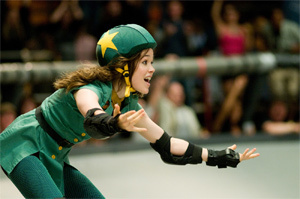 Drew Barrymore makes her directorial debut with Whip It, a film about roller derby and a young woman’s (Juno’s Ellen Page) arduous journey of self-discovery. The combination doesn’t make for anything startling, but results in a colorfully entertaining movie in which Page once again puts her considerable talent on display. Page plays Bliss Cavendar, a young Texas woman whose mom (Marcia Gay Harden) insists on entering her in an endless string of beauty pageants. Bliss reluctantly accedes to Mom’s wishes, but only begins to find her place in life when she discovers roller derby during a night out in Austin. How anyone could be inspired by roller derby eludes me, but live and let skate, as the saying goes. Bliss eventually finds her way onto a team, taking the name Babe Ruthless. Sure she’s small, but she uses her diminutive size to advantage, sneaking past other skaters to score points for her team. It doesn’t require much savvy to know that Bliss will survive all the bumps and bruises. We also have a pretty good idea that Bliss’ dad (Daniel Stern) eventually will throw his weight behind his daughter’s choice. He’s the kind of guy who likes to drink the occasional beer and watch football. Bliss’ surrogate roller derby father appears in the guise of Coach Razor (Andrew Wilson): He’s always fighting with his charges, trying to persuade them to abandon their freelance ways. It’s possible that the lives of the other derby women — Kristen Wiig’s Maggie Mayhem and Zoe Bell’s Bloody Holly — would have made for a more idiosyncratic movie, but Page’s character helps keep things on a mainstream track. Barrymore also appears in the movie; she plays Smashley Simpson, a woman who likes to bump her opponents off the track. In addition to the tension between Bliss and her mom, a rivalry between Babe Ruthless and an opposing skater (Juliette Lewis’ Iron Maven) ups the dramatic ante. Bliss’ best friend (Alia Shawkat) tags along for support until the two have a predictable falling out. Bliss even has a brief fling with a musician (Landon Pigg), an encounter that serves up another life lesson in a movie that’s full of them. Transparent as its intentions are, Whip It is mostly enjoyable. Barrymore deserves credit for pulling off her first behind-the-camera effort. I doubt whether she’s a budding auteur, but she’s chosen crowd-pleasing material and proved that she can handle it.